There’s not much in Monroeville, Pennsylvania. It’s usually a city that travelers bypass on their way to Pittsburgh. The only distinguishing feature is a large shopping mall. Based on its numerous stores and eateries, one could hardly find any evidence that this was the stage for one of the most influential films of the late 20th century: Dawn of the Dead. “Most influential?” A bad case of hyperbole on the part of the writer? No. Zombies: those slow moving, flesh eating, nightmare inducing creatures have taken over popular culture in the late 20th century and beginning of the 21st. Only Star Wars has had a more drastic impact on culture than the 1978 film Dawn of the Dead. The concept of Zombies did not originate from the film. In fact, Dawn of the Dead, is a sequel. Director George A. Romero had a box-office hit with Night of the Living Dead a decade before, but was finding it hard to replicate that success with ventures into other horror films. When being guided through the newly opened Monroeville Mall, the owners remarked that given the number of stores and services one could survive the apocalypse in this mall. What about a zombie apocalypse? 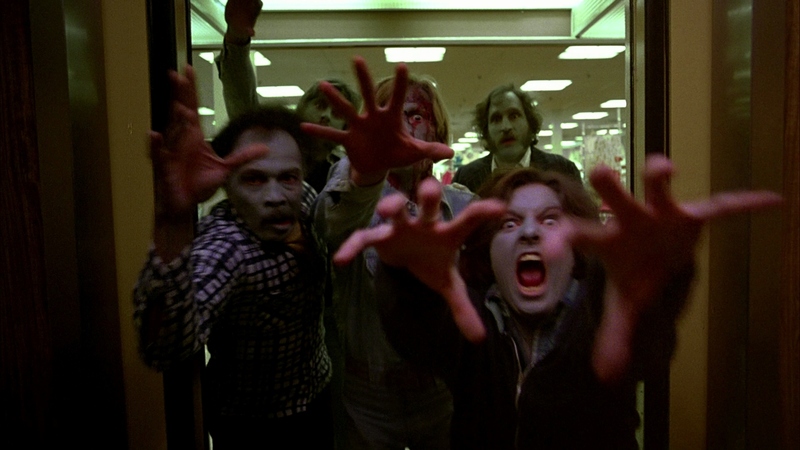 Romero wrote a script featuring a group of survivors who take shelter in a shopping mall to ride out the zombie apocalypse, until everything goes to hell. The finished film is full of satire, social commentary, innovative makeup and special effects, disturbing imagery, and pop culture iconography. 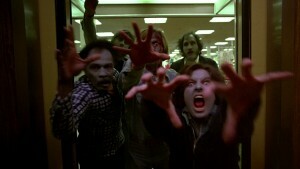 Viewing Dawn of the Dead now it might appear cliché ridden, but, only because of its influence on subsequent movies. What makes the film still unique after all of the imitations or parodies that followed is its satirical edge. Zombies shuffling through the halls of the shopping center grasping at clothes and playing with toys. They wonder around the mall as mindlessly as their living counterpoints. One of the characters remarks on why the zombies congregate at the mall: “Some kind of instinct. Memory of what they used to do. This was important place in their lives.” Mass consumerism of the 1980’s was just around the corner, so Romero’s 1978 Zombie film becomes quite prescient. 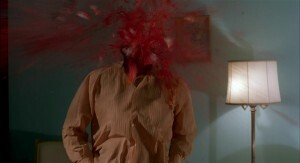 The film’s politics deal with race, and abortion all the while being set within a zombie apocalypse. Think about a Zombie. The mental picture you have is probably one of rotting corpses displaying limited motor skills, shuffling towards you on their unending quest to eat your flesh. How do you kill it? You know the answer: destroy its brain. Make-up artist Tom Savini created wonderful effects including a head that explodes when shot by shotgun, a zombie that takes a machete to the head, or the scalp of a head that is sliced off by a helicopter propeller blade. The image of a Zombie and how to stop it is almost common knowledge, thanks to Romero. Although, the image of the Zombie originated from Night of the Living Dead, it was not until Dawn that it injected itself into the mainstream. The film budgeted under a million dollars, eventually grossed 55 million worldwide. Zombie iconography has made its way into video games, T.V., novels and comic-books. There are even athletic competitions that are zombie themed. Zombies have become an industry. Although the apocalypse hasn’t come yet, it seems that Zombies have already taken over the world.